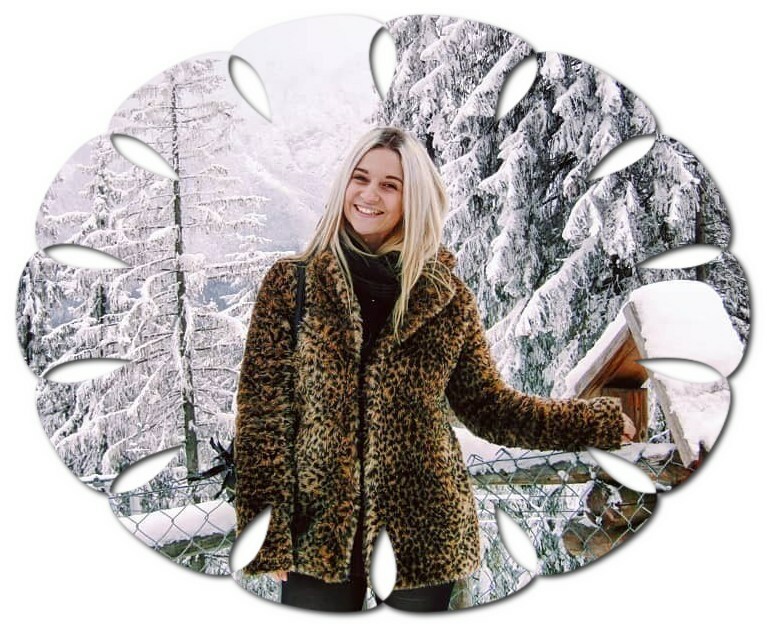 Wrapped up warm in my leopard print (faux) fur coat and thigh high suede boots, I followed Simone down the cobbled streets of Prenzlauer Berg, Berlin, ducking into the doorway of every apartment building to read the names of the tenants, and sighing every time. Apartments in Germany are not like apartments in the UK. Whereas neighbouring apartments in the UK can all look completely different to one another, with old townhouse buildings nestled next to ultra modern glass tower blocks, the apartments on the streets of Berlin all look very similar, with their heavy wooden doors, graffiti-filled doorways and the names of all the tenants listed next to the doorbells. Eventually, we found the name that we were looking for, and rang the bell. A friendly female voice answered, and buzzed us into the downstairs hallway, a beautiful but rather creepy entrance with high ceilings and dark corners – kind of like the typical ‘haunted house’ that you see in the movies. However, while the entrance hall was eerie, our new home for the next four nights was anything but. As Russian born Natalia welcomed us into the apartment that she shared with her German husband Walter, both Simone and I were left speechless by how beautiful their home was. The room that Simone and I were going to be staying in was huge, with a balcony and two large windows, high ceilings and a king-size bed with two fluffy white duvets. We had our own television, stacks of CDs, bookshelves brimming with English-language reads, our own kettle, travel guides, maps, and so much more. We were given clean towels, bottled water, a jar of pretzels with a label that read ‘help yourself!’ a selection of herbal teas, and even a ‘welcome pack’ full of handwritten notes about the best bars, cafes and restaurants in the area. And where did we find this place? For just £40 a night, we had this huge room to ourselves, and a shared bathroom and kitchen with our lovely hosts, Walter and Natalia. As Natalia showed us around the apartment, she made sure to tell us that she had spare USB cables in case we wanted to connect our devices to the television, that the walls were thick so we should play our music as loud as we wanted, that we were to help ourselves to the fresh coffee that she brewed each morning, and that there was a hairdryer we could use in the bathroom. Natalia and Walter had left us a box in the bathroom to store our toiletries, and a free shelf in the fridge on which to store any food and drink that we bought. They told us that we were more than welcome to use their oven to prepare our own meals, and even offered us some of their beers! As we got settled into our new living arrangements, we both came to the conclusion that this was a really great way of holidaying. When Simone and I travelled to Thailand together, we stayed everywhere from dorm rooms, to bungalows, to fancy hotels, but we’d never stayed with a host family like this before. While Natalia and Walter left us to our own devices, they were always available should we need anything, and were more than happy to give us information about how to use the public transport system, where the local bars were, and what to wear if we wanted to get into legendary nightclub, Berghain. Of course, hotel reception desks are usually happy to provide guests with information about the area, but it just felt more genuine with Natalia and Walter, and of course, hotels usually get commission from booking tours or transport for people. With Natalia and Walter, the recommendations were from the heart. Whenever we bumped into them in the kitchen, they seemed genuinely interested in how we were spending our time in their city, and they went out of their way to make sure that we had a great time, with Walter even offering to buy a new USB lead when Simone’s tablet wouldn’t connect to the one they already had. Now of course, this was only one experience, and of course, not all hosts will be as helpful and kind as ours – I think it’s clear that we got really lucky with our pick – but staying in this Airbnb has really opened my eyes to a new way of travel. Usually, I stay in dorm beds in hostels, and while this is undoubtedly a great way to cut costs and meet people, it was nice having the chance to live with a local couple in a real Berlin apartment. Of course, it was more expensive than previous places I’ve stayed (because it was so much nicer! ), and so there’s no way I’ll be able to travel like this all the time, but as a treat, it was a wonderful experience, and it made our time in Germany’s capital that much more enjoyable. Want to know how we spent the rest of our time in Berlin? Click here to read all about it! Have you ever booked accommodation through Airbnb? How were your experiences? Did you get lucky, like we did, or do you have some horror stories you could share? Let me know in the comments below! Psst! If you want to get £30 FREE to spend on your next trip, sign up to Airbnb using this link! You can view and book the apartment we stayed in here. My First City Break – Berlin! What a nice host you’ve got, and at a lovely price too! Really appreciate the little touches hosts do to make guests feel welcome. I tried Airbnb in Kyoto with a Superhost and it gave me a very good impression of Airbnb! I know, it was lovely and so much more personal than a hotel!